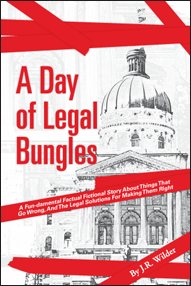 A Day of Legal Bundles describes a day in which a law student and her lawyer fiancé each encounter various legal problems. They find that there are laws and legal procedures that could help them, if they really knew the law. They bungled each situation when they denied the problem, looked the other way, and basically let life – in the form of other people – walk all over them. A Day of Legal Bundles describes their awakening to how everyday laws effect them and how they can get help and lead more fulfilling and prosperous lives as a result. The fact that they are trained in law doesn’t make the legal system easy for them. Their admiration for the ideals of the system makes them resolve to embrace it on a practical level with greater success.